Satellite imagery shows two areas of convection. One is associated with the upper level trough north of Puerto Rico. 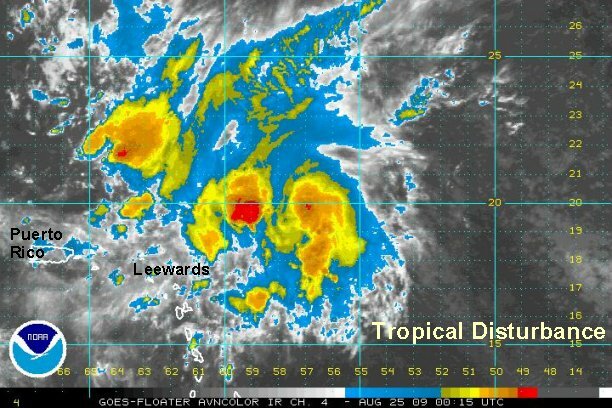 The second area is with a tropical wave which is becoming slowly more organized about 200 miles northeast of the northeast Leewards. Forecast models somewhat develop this system over the next several days. The models are in a little better agreement, but diverge several days from now. Some recurve the tropical feature west of Bermuda in a few days. Another model takes it farther west to near the Southeast U.S. coast by late this week, then up the eastern seaboard during this weekend. The models are in too much disagreement to know which scenario will be the correct one. 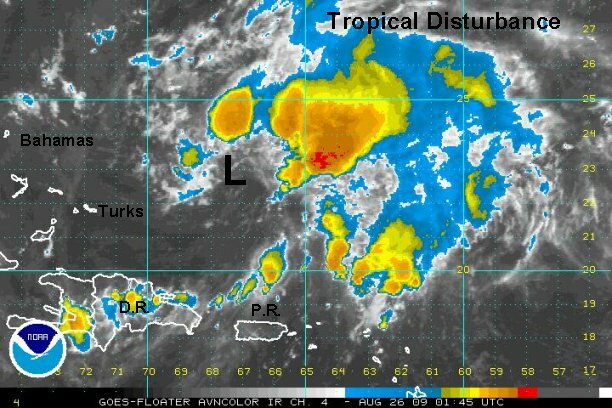 As of 9 pm edt /ast the tropical disturbance was about 200 miles northeast of the Leeward Islands. Movement is west northwest. Interests in Bermuda, the Bahamas, Turks and Caicos, and eastern U.S. coast should follow the latest developments with this tropical disturbance. 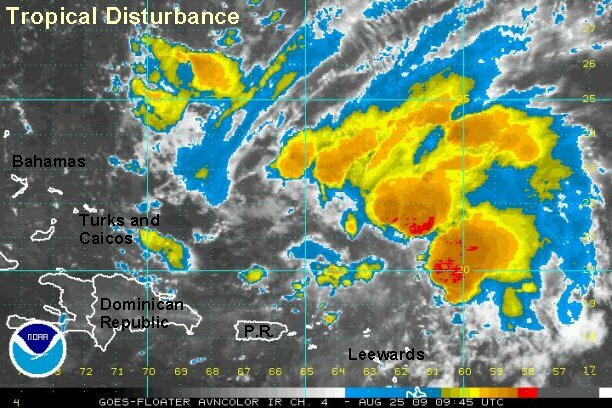 Deep convection continues north of the Dominican Republic eastward to north of the Leewards. 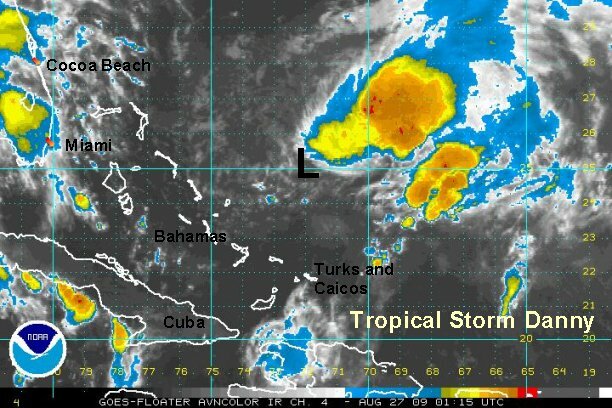 The upper low appears to be stationary as the tropical wave moves in from the east. 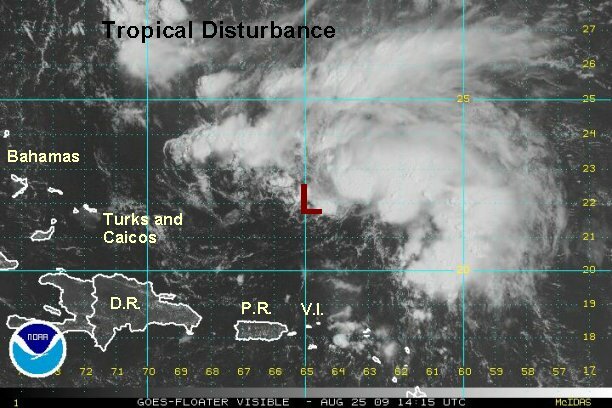 As of 7 am edt /ast the tropical disturbance was about 200 miles north of Puerto Rico. Movement is west northwest. The location of the disturbance was relocated over night. 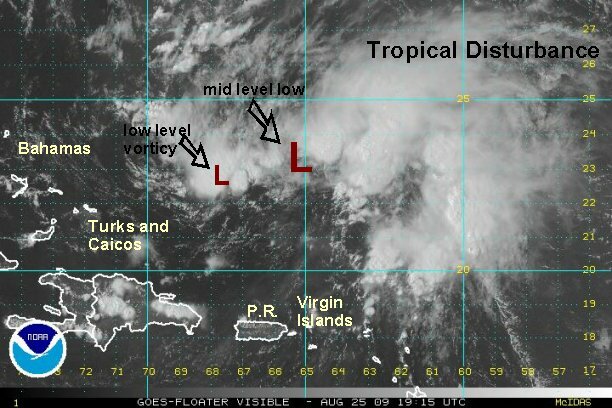 It appears that this may be a situation where the upper low helps develop a surface low as the tropical wave merges. There are no recent Quickscat to tell if a weak surface low has formed yet. Forecast models are slowly coming into better agreement. Tropical forecasts call for the disturbance to move west northwest then recurve north. The question is when will that happen. The range is recurving up the U.S. coast during the weekend to recurving about 300-400 miles east of the U.S. coast. As of 11 am edt /ast the broad weak circulation is roughly centered near 22° N / 65° W or about 250 miles north of the Virgin Islands. Movement is west northwest at about 20 mph. Quickscat did not appear to show a low level circulation yet, but one may form by later today or tonight. Visible satellite imagery details a complex situation north of Puerto Rico. An upper air low is just northeast of the Dominican Republic. 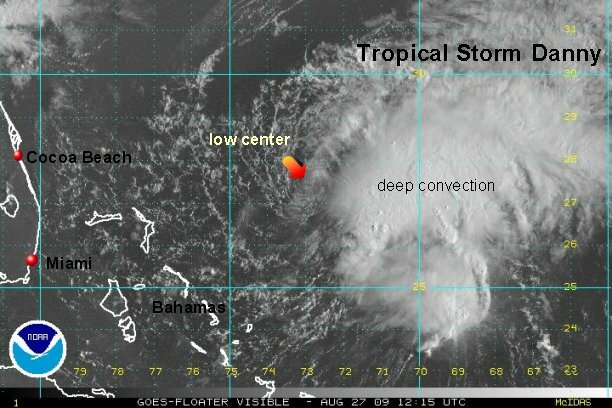 A tropical wave is trailing the upper low. Satellite imagery shows what appears to be a broad mid level center north of Puerto Rico by about 345 miles. Another weak surface vorticity is centered near 22.5° N / 67.5° W or about 260 miles northeast of the Dominican Republic. Low level outflow is noticed with the big thunderstorm complex to the east side. What does all of this mean? It means that the models will have a hard time making a correct forecast when the surface low is not well formed yet. It also means that this is probably not quite a tropical depression yet with the disorganization. It will be crucial for the forecast of which - if any - of the current circulations becomes the dominate one. Currently a recon is checking things out. We'll report back if they find a circulation to classify this tropical disturbance. As of 4 pm edt /ast the broad weak low level circulation is centered near 23.5° N / 65.5° W or about 345 miles north of Puerto Rico. The tropical disturbance is moving wnw at about 15-20 mph. As of 10:30 pm edt /ast I.R. satellite imagery shows no signs of further development. A spin is still noted northeast of the Dominican Republic. This may be one of those rare cases where the upper low sits over a location long enough to develop the surface low. The tropical disturbance is moving wnw at about 15-20 mph. Again, it is hard to trust the forecast models when a real low center hasn't developed. The next complete update will be Wednesday morning. The upper low is now starting to separate itself from the influence of the tropical disturbance. Satellite imagery shows a broad low level circulation centered east of the Bahamas, whereas the upper low is just north of Haiti/Dominican Republic. Winds already support this being classified as a tropical storm, it just lacked the structure to do so earlier than this morning. Recon is not scheduled until this afternoon. We believe that NHC will go straight to tropical storm Danny instead of tropical depression (they should anyway). Buoy data now supports a low level circulation for the first time. Seas are generally 10-15' east of the southern Bahamas. As of 7 am edt /ast the low level circulation is centered near 25.0° N / 69.5° W or about 350 miles east of San Salvador, Bahamas / 795 miles southeast of Cape Hatteras, North Carolina. The "tropical disturbance" is moving wnw at about 15-20 mph. A more northerly turn is expected by Thursday afternoon. There is potential for what will become Danny to become a hurricane before nearing the U.S. coast. Follow the forecast closely. Interests in the Bahamas, and eastern U.S. coast should follow the latest developments with this developing tropical storm. The first visible satellite pictures clearly show that a surface low has formed. At this time the worst weather is on the east side of the circulation - away from the Bahamas. Quickscat shows a large area of winds in the 35-45 mph range with the storms to the east. The west side shows no convection at this time. Buoys ( not in the strongest winds )show seas in the 10-15' range with winds in the 30-35 mph range. Wind shear should weaken, allowing for strengthening in the next few days. 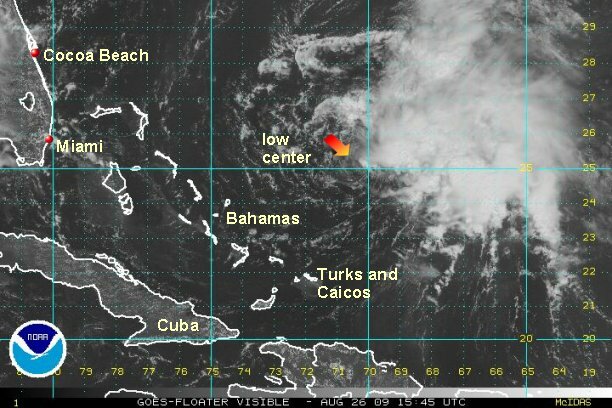 It's just a matter of time when NHC will name it....They are going with their "high chance" of development still. NHC took the high road and named Danny on the 11 am edt advisory as the visible satellite imagery confirmed what we saw a little earlier...that indeed a well formed low level circulation has developed overnight and was supported by sufficiently strong winds on the east side of the circulation. 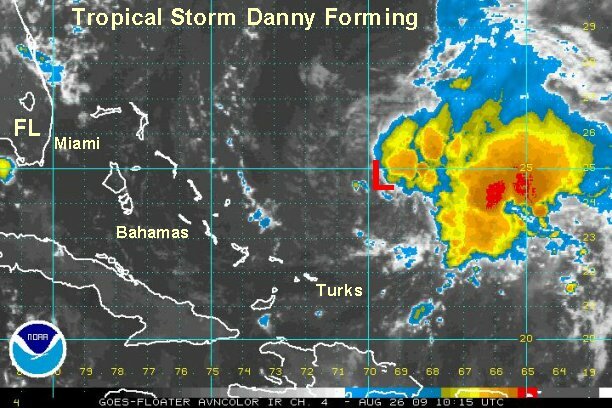 At this time, the weak side of Danny is facing the Bahamas. There is little evidence of a tropical storm to the east. Those conditions could change if the storm becomes more symmetrical. As of 12 pm edt /ast the near 25.0° N / 70.4° W or about 350 miles east of Eluthera, Bahamas / 775 miles southeast of Cape Hatteras, North Carolina. Tropical storm Danny is moving wnw at about 18 mph. Top sustained winds are estimated at 45 mph ( NHC estimates 45 mph). A more northerly turn is expected by Thursday afternoon. 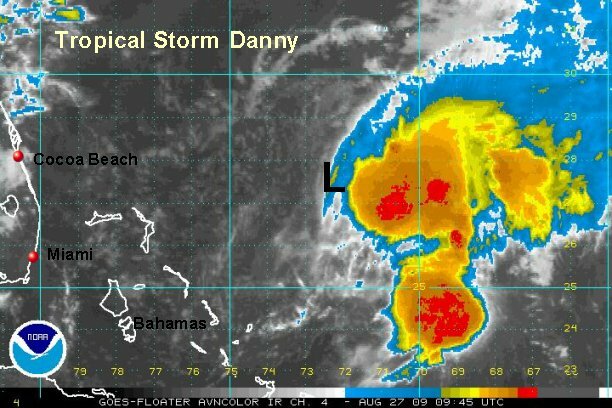 There is potential for Danny to become a hurricane before nearing the U.S. coast. Follow the forecast closely. Satellite imagery, buoy data, and recon info indicate that the strongest winds remain on the eastern side of Danny. The recon found a maximum flight level wind of about 55 mph. Seas remain in the 15-17' range east of the circulation. On the west side ( Bahamas ), it would be difficult to tell that anything abnormal was occurring. As of 4 pm edt /ast the near 25.6° N / 71.2° W or about 310 miles east of Eluthera, Bahamas / 715 miles southeast of Cape Hatteras, North Carolina. Tropical storm Danny is moving wnw at about 18 mph. Top sustained winds are estimated at 45 mph ( NHC estimates 45 mph). A northerly turn is expected by Thursday afternoon as Danny pulls away from the waters east northeast of the Bahamas. We are optimistic that most of the effects will be east of the Bahamas. Forecast models show Danny remaining lopsided until nearing the U.S. coast. Danny will rapidly move up the eastern seaboard Friday and Saturday. There is potential for Danny to become a hurricane before nearing the U.S. coast. Follow the forecast closely. Saturday AM: Near Cape Hatteras to 100 miles east - models diverge here....NHC's position looks good right now. Interests in the Bahamas, and especially the eastern U.S. coast should follow the latest developments with this developing tropical storm. Right now it appears that Cape Hatteras and coastal New England are the highest risk. Cape Hatteras effects we're more optimistic about, but are waiting for a few more model runs. After organizing last night, Danny has changed very little most of the day Wednesday and into this evening. The only noticeable difference is that convection has tried to build over the center of circulation. This must happen for any significant development to occur. The strongest storms remain east of the center where seas are still building, now in the 15-19' range. The forecast models have not changed much either recently. The highest chance of impacts will be on the Northeast coast later this week. As of 10 pm edt /ast the near 25.0° N / 72.0° W or about 210 miles east of Eluthera, Bahamas / 735 miles southeast of Cape Hatteras, North Carolina. Tropical storm Danny has slowed considerably this evening and is only drifting almost west. Top sustained winds are estimated at 45 mph ( NHC estimates 45 mph). Danny continues to stay lopsided overnight with the effects of Danny staying east of the Bahamas. Travelers to the Bahamas may not even be able to tell that a tropical storm is to the east except for some higher than normal easterly swell. Overall the trend for the track of Danny is shifted a little east. One of the more superior models finally decided that the others had a better handle on the situation and joined them farther east. This is the reason that "no one model" is the one we use or is the best. As of 7 am edt /ast Danny was centered near 27.5° N / 72.2° W or about 250 miles east of the Abacos, Bahamas / 560 miles southeast of Cape Hatteras, North Carolina. Tropical storm Danny has apparently reformed to the north overnight. We are basing this on what the recons have found. NHC's wind estimate is based on some recon and microwave wind estimates. We are going a little lower, thinking that these winds are closer to gusts instead of sustained winds. Top sustained winds are estimated at 50 mph ( NHC estimates 60 mph). Movement is to the northwest at 10 mph. A northerly turn is expected by later this evening as Danny pulls away from the waters east northeast of the Bahamas. We are optimistic that the effects other than higher easterly swell will be east of the Bahamas. Forecast models show Danny remaining lopsided until nearing the U.S. coast. Danny will rapidly move up the eastern seaboard Friday and Saturday. There is potential for Danny to become a hurricane before nearing the U.S. coast. Follow the forecast closely. Interests in the Mid-Atlantic and New England U.S. coasts should follow the latest developments with this developing tropical storm. Right now it appears that Cape Cod is the highest risk for some of the effects from Danny. The first visible satellite images confirm that Danny is strengthening as deep convection is building of the east side of the circulation. It also appears that Danny is moving more west northwest than northwest over the past few hours. Seas are in the 15-22' range under the deep convection to the east. There is no new tropical forecast model information at this time. As of 9 am edt /ast Danny was centered near 27.7° N / 73.1° W or about 260 miles east of the Abacos, Bahamas / 545 miles southeast of Cape Hatteras, North Carolina. Top sustained winds are estimated at 55 mph (NHC estimates 60 mph). Movement is to the west northwest at 10 mph. It doesn't happen often, but a new surface center may be forming east of the surface low. The surface low that has been tracked since yesterday is moving west farther from the convection and looking more diffuse. Another low, which is probably a mid level is now under the deep convection. It seems plausible that this new mid level low may take over as the dominate one with the thunderstorm support. What does this mean? First of all don't trust the model forecasts! Some may be centered on the weak surface low others on the developing mid level low. Earlier today some models started to move west again toward the coast. That was probably in response to the surface low moving west. If the mid level low takes over, the current forecast track may be ok. If the surface low moving west remains the dominate low then the track will shift west. Until it is clear which low will be the main one, we will use ranges again in the forecast. 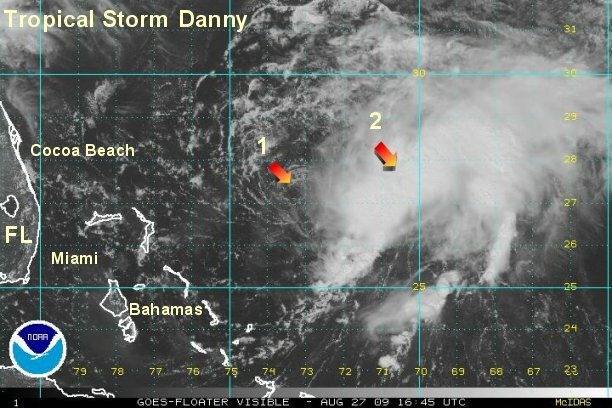 As of 2 pm edt /ast Danny was centered near 27.4° N / 73.5° W or about 225 miles northeast of the Abacos, Bahamas / 485 miles south southeast of Cape Hatteras, North Carolina. Top sustained winds are estimated at 45 mph (NHC estimates 60 mph). Movement is to the west at 10 mph. The mid level low is centered near 27.8° N / 70.8° W. This is 170 miles farther east northeast. The motion of the mid level low is northwest at about 12 mph. In NHC's last write up they acknowledged the westerly motion of the weak surface low, but still went with a northwest movement. They also acknowledged that their 60 mph may be too high. Look for them to lower the speed at 5pm unless there is a sudden burst of convection. Danny will rapidly move up the eastern seaboard Friday and Saturday. There is potential for Danny to become a hurricane before nearing the U.S. coast. Follow the forecast closely. Interests in the Mid-Atlantic and New England U.S. coasts should follow the latest developments with this developing tropical storm. Right now it appears that Cape Cod is the highest risk for some of the effects from Danny. If you live near the Northeast and Mid-Atlantic coast follow Danny closely. 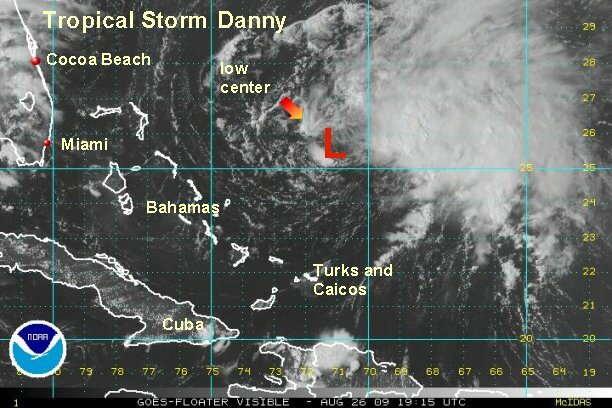 It appears that the weak low center that we have been following will remain the center of Danny. The mid level circulation has appeared to weaken some. In all, Danny is still disorganized. The worst of the weather remains in thundershowers southeast of the circulation center. The eastern Bahamas are seeing only a few showers from Danny. Danny's chance at organizing will come as it approaches the U.S. east coast over the next couple of days. As of 9 pm edt /ast Danny was centered near 28.1° N / 73.4° W or about 250 miles northeast of the Abacos, Bahamas / 510 miles south southeast of Cape Hatteras, North Carolina. Top sustained winds are estimated at 45 mph (NHC estimates 50 mph). Movement is to the north at 6 mph. .
Overnight Danny deteriorated a little more. At this point it is a minimal tropical storm. As it moves up the coast it gradually will become extratropical. We think that Danny will strengthen some tomorrow as it gets an injection of mid latitude energy off of the Mid-Atlantic and New England coast. Overall, the recent developments bode well for travelers and those living on the Northeast coast. The lack of development and the speed at which Danny will be moving later today and tomorrow will help minimize effects. High surf, a period of gusty winds, and heavy showers is still likely especially on the coast of the Northeast. 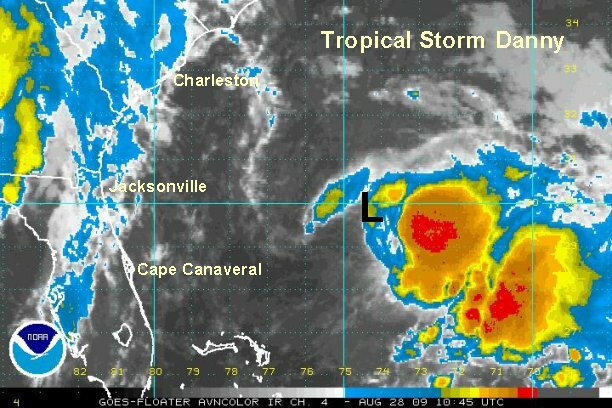 As of 7:30 am edt /ast Danny was centered near 29.7° N / 74.5° W or about 395 miles south of Cape Hatteras, North Carolina. Top sustained winds are estimated at 40 mph (NHC estimates 40 mph). Movement is to the north northwest at 6 mph. Danny will rapidly move up the eastern seaboard later today and Saturday. Danny will likely remain as a tropical storm then transform into an extratropical cyclone as it approaches Nova Scotia. Interests in the Mid-Atlantic and New England U.S. coasts should follow the latest developments with this tropical storm. Right now it appears that Cape Cod is the highest risk for some of the effects from Danny. If you live near the Northeast and Mid-Atlantic coast follow Danny closely.